Background: Tumor Necrosis Factor (TNF) is a significant cytokine produced by activated monocytes/macrophages that exhibit selective cytotoxicity against various tumor cells. It has attracted attention as a potential antitumor agent through the regulation of cell proliferation, differentiation, and apoptosis. Need: Chemotherapeutic agents lack target specificity while TNF specifically attacks malignant cells through the Tumor Necrosis Factor Receptor (TNFR). TNF showed severe side effects in phase I & phase II clinical trials which restrict its dosage to such an extent that no persistent anti-cancer effect has been seen. Thus, TNF has a limited role in treating human cancer unless its side effects are minimized. Formerly, no researcher has designed molecules targeting TNFR. In order to design novel chemical entities, active binding site of the receptor must be known. 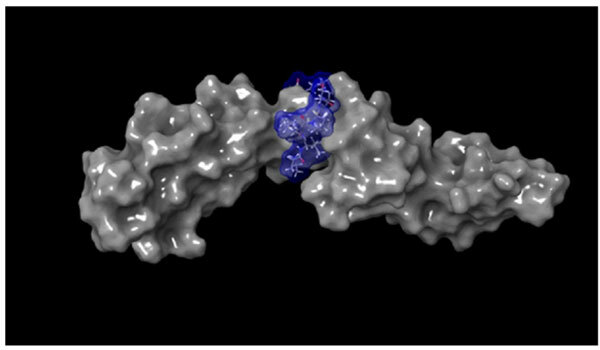 Objective: The study aimed to predict the active binding site of TNFR1 using molecular modeling approach and further designing of novel peptides targeting TNFR1. Method: Various in silico studies were performed to predict and validate the active binding site of TNFR1. Results: The present in silico study of TNF β-TNFR1 complex predicts the active binding site of TNFR1 and the same was validated. Drug repurposing approach was used to define the need for designing anticancer molecules targeting TNFR1. Novel peptides were designed that target the active binding site of TNFR1. This study may open up the new avenues towards the designing of novel potential anticancer molecules targeting TNFR1. Conclusion: This study has implications in the rational designing of novel chemical entities that target and modulate TNFR. Antitumor agent, TNF, TNFR1, SiteMap analysis, Docking study, TNF β-TNFR1 complex, In-silico.